Ulcerative colitis is a form of lifelong inflammatory bowel disease– or IBD. The condition causes chronic inflammation and ulceration in the lining of the digestive tract – usually in the colon. Although the disease is generally not life-threatening, the symptoms can be embarrassing and uncomfortable. Many patients with ulcerative colitis suffer from urgent bowel movements, abdominal pain and bloody diarrhea. I have ulcerative colitis and am very concerned about getting through the morning of my son’s wedding. Are there any over-the-counter medicines I can take for colitis? Unfortunately, there is no cure for ulcerative colitis, but it can often be controlled with the right treatment. 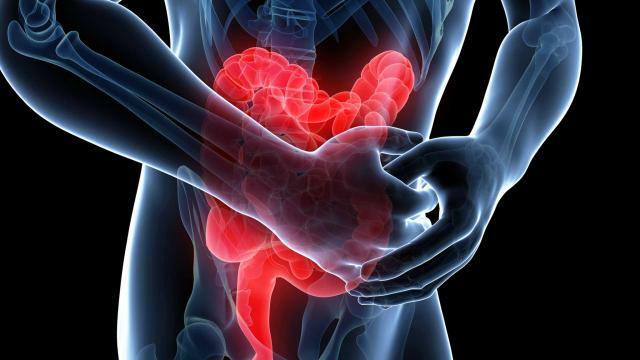 Most treatments for ulcerative colitis work by reducing the inflammation of the colon. This allows the colon to heal and the symptoms to subside. Therapies can include medications, changes to your diet and nutrition and sometimes even surgery. However, if you are looking for a quick fix before a big event, Dr. David Rubin, a gastroenterologist and the co-director of the Inflammatory Bowel Disease Center at the University of Chicago Medicine, said there are over-the-counter medications you can take. “I recommend using Imodium, which can be purchased over-the-counter one hour before the event, and not eating for about two hours before the event. This should provide a little more control,” Rubin told FoxNews.com. Around 700,000 Americans suffer from ulcerative colitis. Scientists don’t know what causes this condition, but they do know that men and women are equally affected and most people are diagnosed between the ages of 15 and 25 years old. Ulcerative colitis also tends to run in families and is more common among Caucasians, especially those of European origin and of Jewish heritage. “It’s important [that patients] to talk to their gastroenterologist to make sure they are optimizing their current medicines. We have made some tremendous progress and there are new therapies that heal the bowel, and a healed bowel in ulcerative colitis provides very good control, not just for big events but every day,” Rubin said.